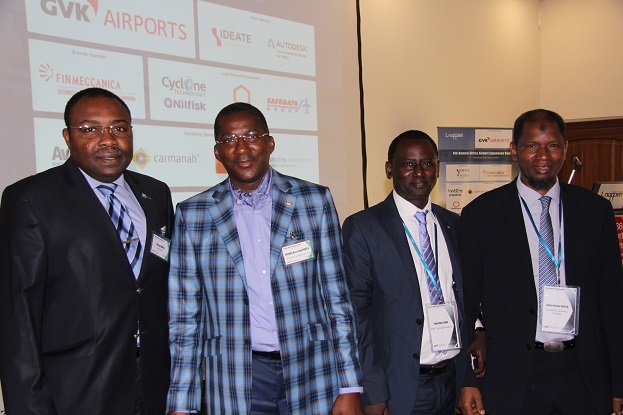 Dubbed the 4th Annual Africa Airport Expansion Summit, the conference brought together key players in the industry from various countries and organizations across the globe. They include ACI Africa, ADPI, ADS – Senegal Airports, ǼLEX, AERIA, Africa World Airlines, Air Ghana Ltd, Angolan Civil Aviation Authority, Aurecon, AVIACO-GSE, AVLITE, Bentsi-Enchill, Letsa & Ankomah, BlueScope Buildings, Brussels Airlines Ghana, Carmanah Technologies, Cellcomm Solutions Ltd, CHEC – China Harbour Engineering Company Ltd, China Airport Construction Group Corporation-CACC, Cyclone Technology, Delta Air Lines, GSA – Ghana, Dufry & GTDC Ltd, Ecobank Ghana Limited, ENCON International, ENNA Algeria, Ethiopian Airports Enterprise, Finmeccanica,GACL – Ghana Airports Company Ltd, Gateway Services Limited. Others are, Gauff Consultants, Gauff Ingenieure, GCAA, Geci Group, Ghana Air Force, Global Load Control, GVK Airports, Honeywell, IATAS, Ideate Technologies, Infologic Nederland BV, Kenya Civil Aviation Authority, Kolin Construction Co, Liege Airport Consulting, Lufthansa Consulting, Mango Aviation Services Ltd, Munich Airport, NACO – Netherlands Airport Consultants, News Ghana, Nilfisk Cyclone Technology, Pan African Chamber of Commerce and Industry, Régie des Voies Aériennes s.a, RwandAir, Safegate Germany GmbH, Sierra Leone Civil Aviation Authority, Sky Express, Smiths Detection, SOGEAC, South African Airways, Special Mobility, Starbow Airline, TCR, Uganda Civil Aviation Authority, UK Trade & Investment. Over the past few years, business activities at African airports have grown from 45 percent to an overwhelming 80 percent. Passenger and cargo traffic volumes are growing at a never seen rate and to accommodate this increase, many airports are upgrading and there are plans for at least 40 new airports across Africa. Opportunities for airport contractors, suppliers of airport equipment, management services and other products and services are unprecedented. It is expected that the two-day summit will trigger discussions among government officials, investors, civil aviation authorities, airport management groups and with consultants, architects, construction companies, equipment providers and service groups, in order to better explore the market and support the project development. Development in Africa with a focus in West Africa and Secondary Airport Expansion in Africa and the Profitability Concern. Others are Airport/Airline agreements and rate methodologies: practices and characteristics and An Introduction to Runway Pavement Rehabilitation without Interruption of Airport Operation. News Ghana, the country’s leading online news publication for business executives in West Africa and the continent happens to be one of the proud media partners for the summit.